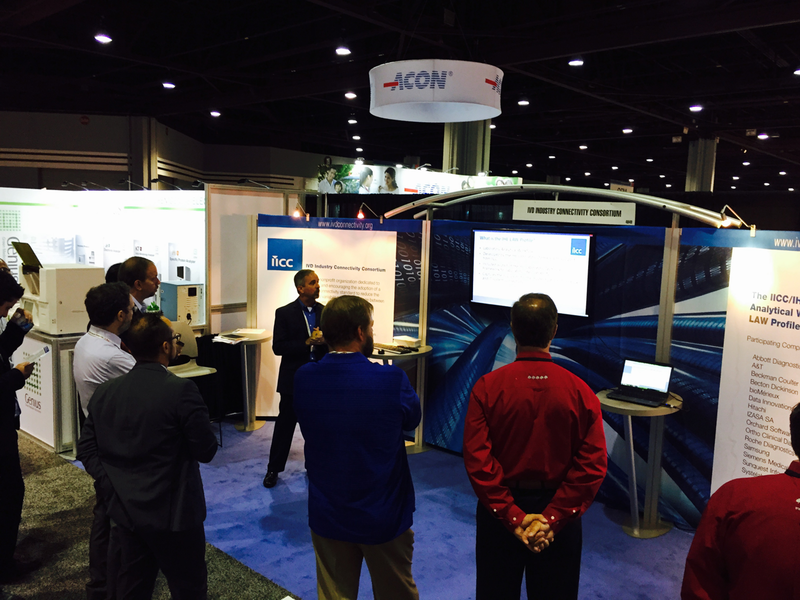 At its booth at AACC 2015, the IVD Industry Connectivity Consortium (IICC) successfully conducted live plug and play instrument connectivity demonstrations of the IICC/IHE LAW Profile. It involved one analyzer (Abbott) and one analyzer manager (Orchard Software) in the booth, as well as one remote analyzer (Beckman) connecting over the Internet to the cloud-based IHE Gazelle Order Manager simulator. In addition to establishing a plug and play connection and exchanging work orders and test results using the LOINC vocabulary, the participants also demonstrated several features defined in the LAW Profile, including the rejection of a test order request by the analyzer, an analyzer reflex request, and an analyzer rerun request. Participating vendors had successfully tested their LAW Profile v1.4 implementations earlier in July at the LAW Virtual Connectathon 2015.